I have a new computer. As happens during the first few weeks with a new computer, I find myself spending a lot of time installing and updating software. 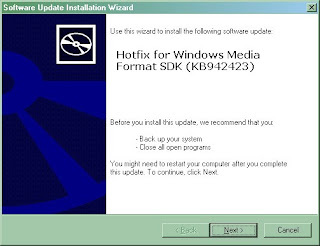 This includes many automatic updates by Windows and other software packages that keep the system busy downloading and installing all the patches that have been released since whenever the maker of the computer created the disk image. Many of these automatic updates require that I restart the computer. One of the latest restarts was due to upgrading Internet Explorer from version 7 to version 8. On reboot, the system launches IE8 and leads me through several configuration options. Eventually it takes me to the browser and displays a Welcome to IE8 page. 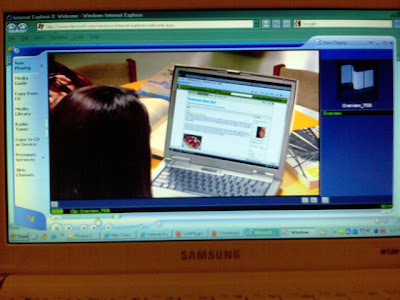 Most of my display is consumed by a picture that links to a video introducing Internet Explorer 8. Although IE is not my primary browser choice, I am interested in how it differs from IE7. I click the video image. Media Player launches. As I watch the loading progress indicator in Media Player grow, I'm thinking it odd that the video didn't play embedded in the web page. Then an error dialog appears. 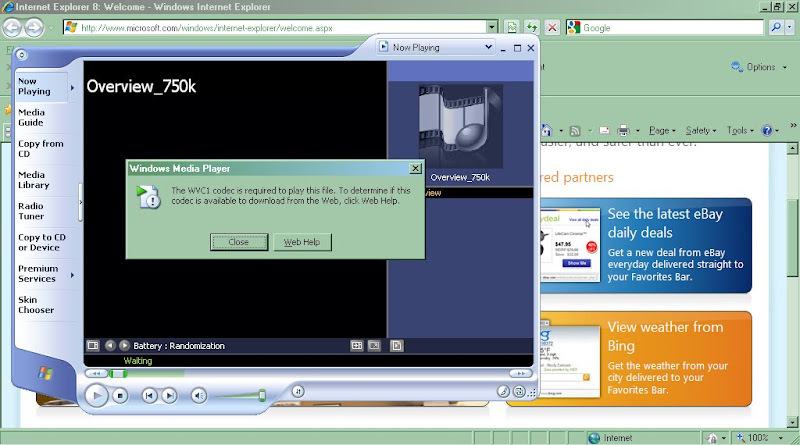 It appears that my computer doesn't have the required video codec for Microsoft's IE8 introduction video. I think "Why isn't this packaged with IE8 or Windows? Is Microsoft not using a standard codec for their videos?" 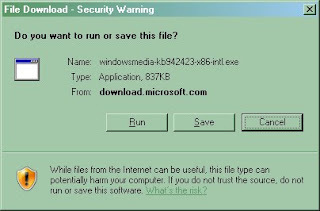 I then start thinking of my last experience with missing video codecs: an experience that led me down some shady alleys of the Internet that resulted in getting a computer infected with all kinds of Trojan crap that still effects that computer. Even removing the crap with virus and spyware programs didn't fix it. 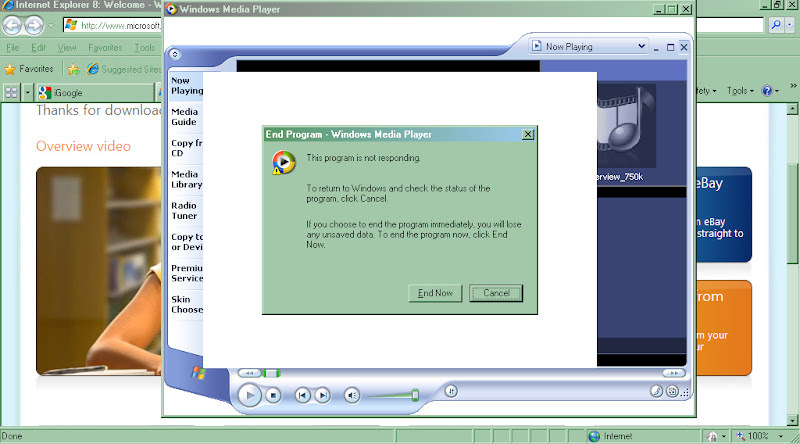 I even ended up paying $50 for codecs from a legit company and still can't play most WMV videos on that system. I don't dare go down that path again. I reluctantly follow the instructions and click the Web Help button. This takes me to a Microsoft Windows Media help page about the error. At the bottom of the help page, there's a link to a web site at which I'm told I may be able to find a codec to download. I click it. I then get a page stating that Microsoft has retired the web site to which their software sent me to find the codec I need to view their video that introduces Internet Explorer 8. So, now more intrigued by what it will take to get the video to play than any interest in the video, I do a Google search for the missing codec. I immediately notice the red and yellow icons put on the page by McAfee Site Advisor indicating that sites are known distributors of malicious code. As I view the first few pages of results, I see warnings for many of the sites in the results. Most of the search results appear to be discussion forums with others complaining about missing this same codec. I then go back to the first page of results and see that the second result is a support.microsoft.com URL. Hopeful, I click it. This is looking hopeful. I scroll further down the page and read "This problem occurs because the WVC1 decoder is not included together with Windows XP." I think "Not included? Why not? If not included with Windows XP, why not with the Internet Explorer 8 upgrade? 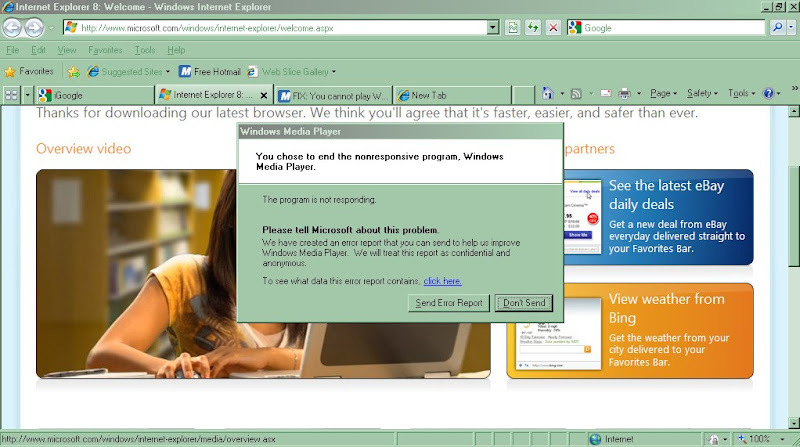 And if Microsoft knows it isn't included with XP or IE8, why would they pick it for the video introducing users to IE8?" I click the download link. My screen goes blank. I wait. 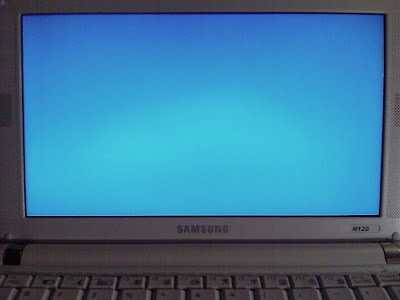 My screen just glows with the bluish white of the LCD backlight. My computer has crashed. Frustrated, I hold down the power button to force a shutdown. I turn the computer back on, wait for Windows XP to boot, login, and then launch Internet Explorer to try again. I go back to the Microsoft support site and click the download again. This time it doesn't crash the computer. I run the patch install. I see that it warns me to back up my system and close all open programs. Already frustrated that viewing a video has been so painful, I'm not going to spend more time backing up my system. I proceed with the install. 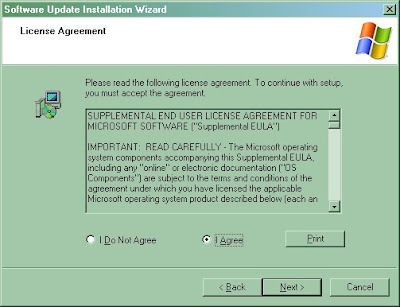 I'm shown a long license agreement, part of which appears to be in French instead of English. I select "I Agree" to something I neither have the patience or skill to understand. Upon clicking next, the setup tells me that it is Backing up my files. 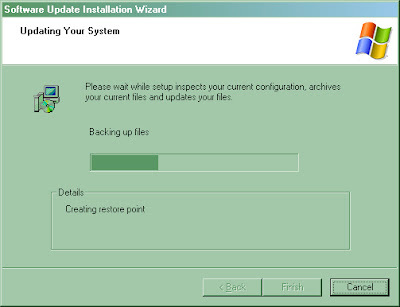 I wonder why it told me to backup at the start if it is backing up impacted files now. Eventually the install completes. After closing the installer, I try to view the video again. The Media Player stops responding when I press play. Clicking the End Now button seems to do nothing. I click it multiple times before it finally kills the process. Now, after all this trouble, I'm asked if I want to tell Microsoft about this problem. I click the Don't Send button while thinking "I'm not sending any error report, but I am blogging this!". Not being one to give up too easily, I try one more time and am able to play the video. Finally, the video is playing but I no longer care what features are new to IE8. After this experience, I don't plan on using it any more than absolutely necessary. Hell yes! Alternative media player, alternative OS. Story above is quite similar to experiences I had with BOTH Snow Leopard AND Windows Vista. That's why I say, the next operating system I run (when XP is no longer viable because MS pulls all support in 2010) will be Linux.